You need a pat on your back after completing a rehab. However, the road beyond your rehab journey is a tough one. The hardest part that comes in your way is the one behind you. As summer unfolds, so does a new chapter of your life. Old or new friends; it does not matter. As long as you have people to be with you this summer, then all will be fine. 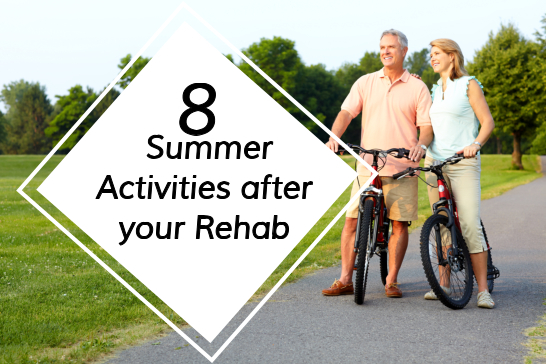 You can go and enjoy fun summer activities and catch up. If you find old friends a threat to you living a healthy and more independent life, you can happily walk out and end your friendship. It is important that you make good decisions in life. Surround yourself with people that will make you do just that. The warm heat of the sun allows you to do a ton of things. You can start up a new hobby. You can pursue an activity you have been dreaming of doing your whole life. The trick here is to be busy. Do not sacrifice the things you have given up in order to go back to level one and start all over again. Remember, you have made it in rehabilitation. Who says you cannot make it in life too? Do not be so hard on yourself. Stress can only trigger harmful effects such as relapse or an added salt to your wounds. Do not be affected by it. You can opt for activities that can help you relax. Such activity includes yoga, massage and much more. Get inspiration by connecting with others in need. You can volunteer in your local charity. You can also provide companionship to people who have the same problem as you. Or you can go and be active in your church. Find ways on how you can motivate yourself. What is the finest way to go through the summer season than to celebrate the success of your recovery? Celebrate your success with friends or with the people you love, especially those who have been with you through your rehabilitation. You can also pamper yourself in a salon or treat yourself to a fancy restaurant. You deserve it. You are not alone. You have with you professionals from Pioneer Trace Healthcare & Rehabilitation. We provide Rehabilitation Services in Flemingsburg, Kentucky, especially those who have undergone surgery and other medical concerns. There are many things you can do to make your summer great. All you need to have is a positive attitude and a healthy outlook in life. Visit www.pioneertrace.com for more information.